Dates: Not offered in 2014 except as a custom trip. 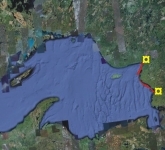 This trip traces the entire Lake Superior Park coastline from our paddling centre at Michipicoten Bay in the north to Montreal River in the south. It’s a perfect sea kayak journey for intermediate paddlers wanting to explore the entirety of this geologically diverse, wildlife-rich and culturally significant coast. Your trip begins with an afternoon of individual and group sea kayak safety coaching from our base on Lake Superior near Wawa, Ontario. Later we’ll enjoy a trip orientation following a home-cooked meal in the front room of Rock Island Lodge with its spectacular view of the lake. Trip fee includes tent site on our beach or alternatively in the lodge at a trip guest discounted rate. Following breakfast the next morning we load our kayaks and head out entering the Park at its northern boundary at Smokey Point. It’s a spectacular coastline of clear waters, rocky headlands, sandy beaches – a landscape carved by 10,000 years of wind and water. Near Old Woman Bay we’ll see Ojibway Pictographs, the first of many native cultural features in the Park. Beyond Old Woman we’ll make a short hike through Ontario’s version of a rainforest to Till Creek Falls, the highest in the Park. Near Gargantua we’ll be leaving a tobacco offering at Nanabush Rock (Devil’s Chair) and checking out the cliffs at Devil’s Warehouse Island for peregrine falcons, caves and a hidden pictograph. Forests are a deep green boreal and transitional mix interspersed with rare Arctic disjunct plants. Our trip takes us past wonderful geological formations including diabase dykes, pillow formations, and rust-coloured volcanic rhyolite. Closer to Agawa Bay, the Pictographs, stone paintings made by native Ojibway on bedrock, are best seen from the water. 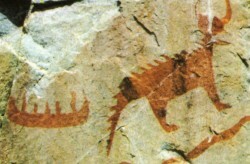 The most significant pictograph is that of ‘Mishipishu’, the great horned lynx that the Ojibway believe lives in and lords over Lake Superior. The final leg of this trip is a special treat as it explores the rarely paddled smooth granite cliffs south of Agawa Bay. This is a trip for paddlers in good condition with previous paddling and wilderness camping experience. 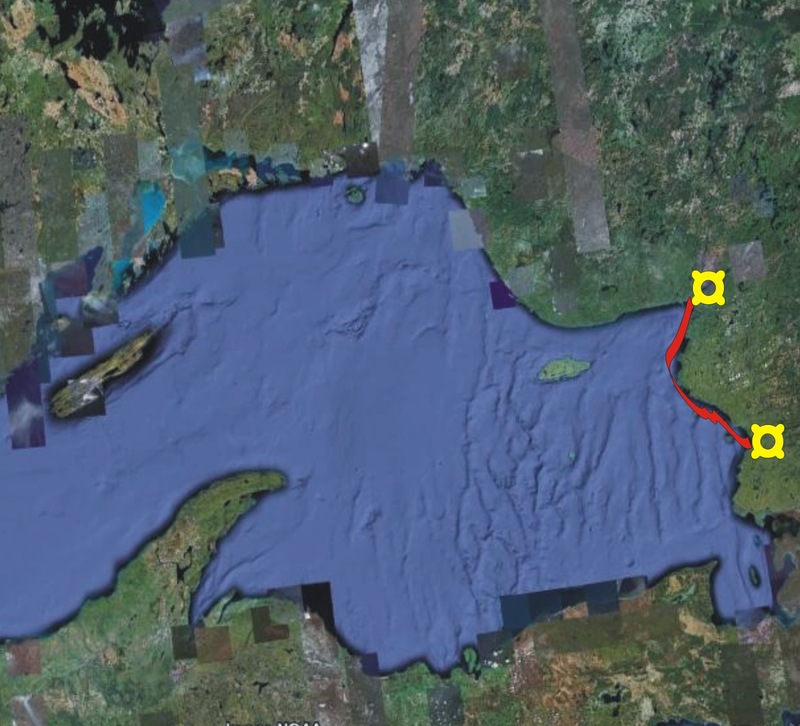 Daily paddling distances range from 10 to 26 kilometres (average 19 km) with a day included to accommodate rough weather or a more relaxed or exploratory group pace. The lake is mostly calm in summer, but when it gets rough we enjoy the view from shore. Although each group will travel according to its own pace, we tend to spend most of the day on the water leaving lots of time for “covering the distance” and exploring the coast. On this trip, paddlers choose between packing and preparing their own meals or joining in with our hearty and healthy meals/snacks packed and prepared by your guide(s). Most participants will be in single sea kayaks although occasionally we open trips to less experienced paddlers in double sea kayaks. You’ll be responsible for carrying a portion of the group gear in your kayak, along with your tent, sleeping bag, personal gear and food. If you’re bringing your own sea kayak it must be sea worthy, at least 16 ft long with two sealed bulkheads, deck-lines and closed cockpit. You’ll need to come equipped with a PFD and signal device, bailer and 20m/55ft of floating rope. A detailed packing list is provided following registration. Our Guides are drawn from outdoor adventure/recreation programs or they are teachers and outdoor professionals. They are certified with Wilderness Advanced First Aid (40 hrs), our own established Sea Kayak Guide Course and sea kayak advanced skills and instructor programs certified by Paddle Canada. Many return to work for us year after year. They are all great paddlers with a love and appreciation for Lake Superior’s heritage, history and ecology. 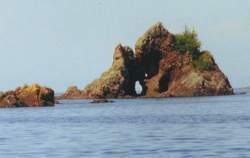 Naturally Superior Adventures was established in 1994 with a focus on Lake Superior and silent sports. Sea Kayaker Magazine readers have kindly voted us as Eastern Canada’s best company for guided tours by sea kayak since 2009. Check out more photos of this trip in our Photo Gallery.